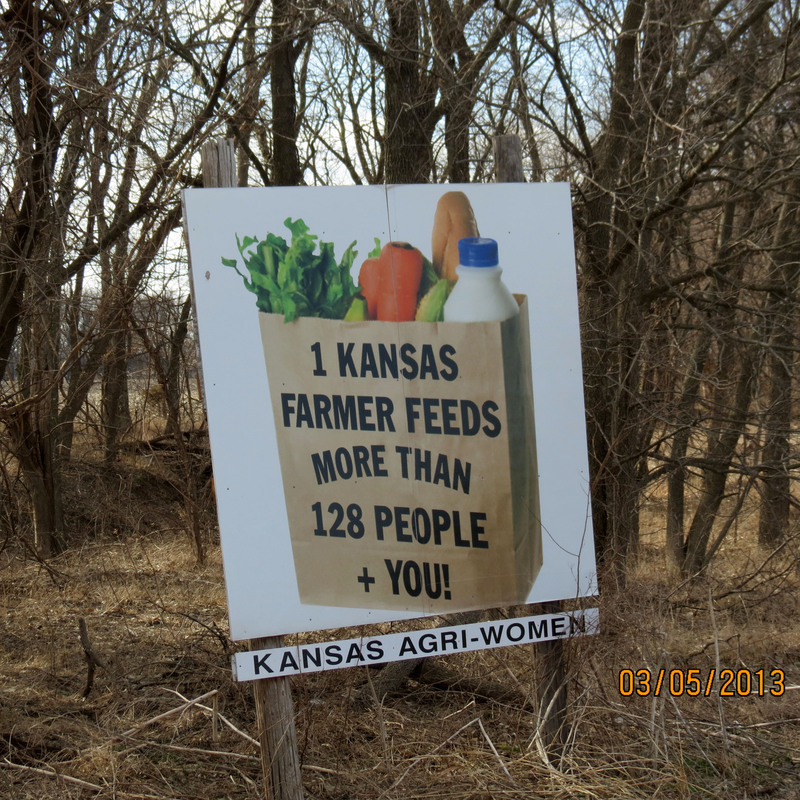 If Kansas had an official state billboard, it might be a squat, square sign featuring a cornucopia of a paper grocery bag and the words “1 Kansas Farmer Feeds 128 People + You.” First erected in 1978,1 these signs make a simple and direct point: Every farmer who works the land produces the meals of many non-farmers. Which is why a lot of people were worried when, in 1986, the government predicted that the number of farms in the U.S. was set to fall by half. That prediction was made by the Office of Technology Assessment in a 1986 report on the changing state of agricultural technologies. There were 2.2 million farms in 1982, the OTA wrote. There were likely to be 1.2 million by the year 2000.2 The idea wasn’t so much that food production would fall — those 128 people + you would still be fed — but that who they were fed by was changing. Farms were industrializing, consolidating — and midsize farms (of the Old-MacDonald, Farmer-in-the-Dell sort) would be the losers. But here’s the weird thing: The OTA’s prediction didn’t come true. There were about 2 million farms in 2002, according to the Agricultural Census. There are still about 2 million farms today. At the same time, though, the OTA was right: Farm consolidation really did happen. How can both be true? The devil is in the methodology. These numbers don’t represent a failure of the OTA’s predictive powers, but rather a great example of how the ways we measure things can stop being effective. More importantly, this trend shows how a combination of inertia and political interests can make it hard to change a methodology even after it is clearly outdated. Today, agricultural experts track farm consolidation by looking at things like distributions comparing the size of farms, the number of farms in each size category and the share of available cropland being used by each category of farm. A 2013 Department of Agriculture report, for instance, found that, in 2001, farms of 1,000 acres or more accounted for 5.6 percent of all farms and controlled 46.8 percent of all cropland.3 In 2011, those large farms still represented 5.6 percent of all farms, but now they controlled 53.7 percent of cropland. During that same time period, the number of very large farms — 2,000 acres or more — grew from 1.7 percent of all farms to 2.2 percent. In other words, a relative handful of big farms are getting even bigger, even though the amount of land being farmed stayed about the same. Large farms are getting larger. Above, the global headquarters of Wonderful Citrus in Delano, Calif. But one of the most prominent measures of farm consolidation remains the number of farms — it’s right there in the first sentence of the Agricultural Census report. That figure has remained more or less flat through all the upheaval. That’s because the number of very small farms has been growing: In 1982, there were about 637,000 farms of 49 acres or less. In 2012, there were more than 800,000, a 28 percent increase. So while there are more big and small farms, there are fewer farms in the middle. But the increase in the number of small farms is misleading. The phrase “small farm” probably calls to mind a world of produce stands, hayrides and artisanal goats. But that kind of operation isn’t what’s driving the growth of small farms. Most small farms, in fact, aren’t really farms at all, at least not in the sense that those Kansas billboards mean. The Agricultural Census defines farms as “any place from which $1,000 or more of agricultural products were produced and sold, or normally would have been sold, during the reference year.” That $1,000-a-year threshold was low when it was set in 1975; it’s even lower today because it was never adjusted for inflation, said Allan Gray, professor of agricultural economics at Purdue. If it had been, the cutoff would be closer to $5,000 today. What’s more, the USDA interprets “normally would have been sold” broadly, so it includes land that could, theoretically, produce agricultural income — even if the owners never had any intention of donning a pair of overalls and a co-op hat. “I own three acres where my house is built,” Gray said. “I’m right on the edge of being considered a farm because my yard would have almost the potential to create $1,000 in revenue. I’m not quite a small farmer, but I almost could be.” These little spreadsheet farms aren’t anyone’s primary source of income, Gray said. In fact, the people who own them tend to have incomes above the median for America as a whole. These aren’t the farms of the poor; they’re the yards of the upper-middle-class. Many large residential properties, especially in states such as Tennessee and Texas, qualify as “farms” under the government’s official definition. Both MacDonald, inside the USDA, and Gray, outside of it, agree that the current definition of “farm” creates misleading statistics. So why not change the definition? The answer is partly bureaucratic inertia. MacDonald said that agricultural policymakers know consolidation is happening and they take that into account. Nobody who writes the Farm Bill — the national agricultural policy bill that Congress updates roughly every five years — seriously believes the number of farms hasn’t changed in 30 years. But politics also plays a role. The definition — and any push to change it — is up to Congress, MacDonald told me. For farmers and their political supporters, there are probably benefits to the perception that there are lots of small farms scattered across the country, Gray said. “The Farm Bill might be a bit harder to garner enough votes to be passed since there would be far fewer small farms to be counted and a perception that large farms don’t need government support,” Gray said. There’s a potential legislative downside to changing the definition and a potential bureaucratic upside to leaving it alone. And that problem only gets more tangled when you consider how a changed definition might affect individual states. In 2009, some of MacDonald’s fellow researchers at the Economic Research Service published a paper evaluating the impact of alternative definitions of what counts as a farm. The researchers found that small farms are distributed unequally across the country. Say you upped the threshold to $10,000 in revenue, instead of that paltry $1,000. Texas’ share of U.S. farms, for example, would drop by 3 percentage points. In the heavily agricultural 13th district alone, that could mean cutting the number of farms by more than half, to 8,000 from about 20,000.5 Some of those lost farms may be farms in name only, but others could be real operations that just don’t make much money. Part of the problem with the broad definition we use now is that it’s difficult to tell the difference between real farms and ones that exist only on paper. That redistribution of farms would also result in a redistribution of certain kinds of federal funding for agriculture. In 2009, $200 million for land-grant-university-based agricultural research and $1.3 billion for conservation programs were divvied up to the states based in part on each state’s number of farms. A change in the definition of “farm” could leave states like Texas with less of that pie. So in the end, the OTA’s 30-year-old prediction turned out to be correct — there are almost certainly fewer working farms today than there were, and especially fewer midsize farms. It’s just that nobody has a strong incentive to revise the data to show it. The number of people a Kansas farmer feeds used to be updated regularly, but that stopped in 1999, when the Department of Agriculture stopped tracking that as a statistic. The billboards are still there, though. I saw them last summer while visiting family. Different sources, even within the U.S. government, count farms using different methods and different schedules, so they produce inconsistent results. Where possible, I’m using Agricultural Census data, but the OTA count of farms in 1982 appears not to be drawn from that. The average farm size is 434 acres as of 2012. The other big increase in small farms came in 1997, when the USDA changed the methodology by which it conducted the Agricultural Census, MacDonald said. The census was always adjusted to account for farmers who didn’t respond to its surveys, but until 1997, it didn’t account for the accuracy of its own mailing lists. So, for that census, the USDA picked 11,000 random 1-square-mile areas and sent out researchers to find farms that weren’t already receiving the census survey. The agency now does this for every census. The 12,000 farms that would no longer be counted includes farms with sales under $1,000. That might seem a bit confusing, but remember, the definition isn’t based on actual sales, it’s based on the potential for sales. So these farms met that definition — as evidenced by their inclusion in Agricultural Census data — even if their actual sales were lower.